The Friends of the ANBG's Botanic Art Groups will hold their 12th annual exhibition and sale, with the theme 'more than just a pretty plant'. The works on show will feature plants with traditional and modern uses as sources of food, medicine, and materials for making practical objects and artworks. Most of the works will be on sale, with a proportion of the proceeds donated to the Friends of the ANBG to support the Gardens. Several works will be chosen to be donated by the Friends to the Gardens' permanent collection. As in previous years, there will also be a work to be won by the lucky winner of a raffle. 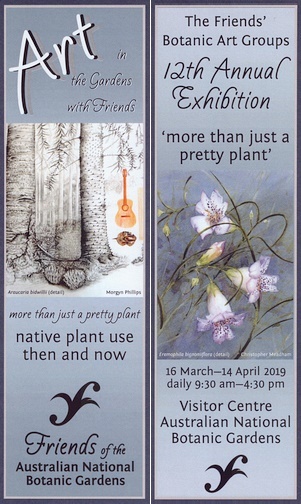 This year it was decided that the theme of our art exhibition should celebrate native plants and their uses. The many diverse and sometimes surprising uses of Australian flora are often under-appreciated. The exhibition was inspired by a small book, 'Ngunnawal Plant Use' which highlighted the many uses of Australian plants by the traditional custodians of the region, the Ngunnawal people. Many of the subjects chosen have a contemporary as well as traditional use. To accompany the exhibition the Friends’ have published a book featuring over 60 botanical works of art from the exhibition. This will be available for sale at a price of $25, and all proceeds from the sale of book will go to the Friends. The book would make an excellent gift for friends and relations. All the stunning paintings are for sale, as well as a range of cards. In previous years we have found many paintings sell quickly. Don’t be disappointed; take the opportunity to visit the exhibition at the Visitors Gallery early. There is a special Friends’ preview on the afternoon of Friday 15th March. You can also order the 'More Than Just a Pretty Plant' book to be delivered to you - please print and complete the order form and then either post it or scan and email it back to us.